Peak Sunset: Mt. San Jacinto at sunset, across from Cherry Valley. Photo courtesy of Robert Leonard. 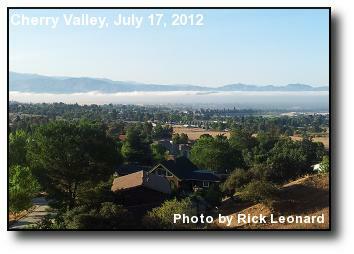 Fog Bank: Summer marine layer reaches the lower extents of the Banning Pass. Photo courtesy of Rick Leonard. 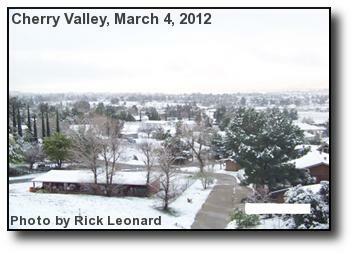 Sunday Snow: Snow accumulates in Beaumont from March's second cold storm. Photo courtesy of Rick Leonard. 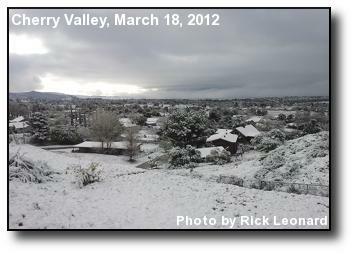 Snowy Weather: The first cold storm of March leaves Cherry Valley temporarily white. Photo courtesy of Rick Leonard. 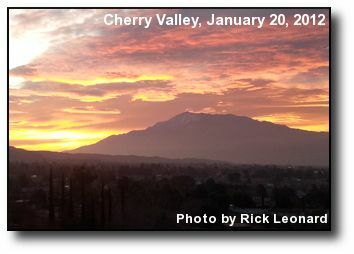 Mountain Sunrise: A panorama of the Beaumont area, including Mt. San Jacinto, in the colors of sunrise. Photo courtesy of Rick Leonard. 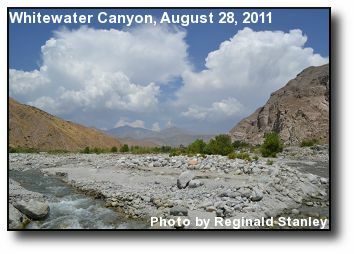 Desert Thunderstorms: Late summer desert thunderstorms near San Gorgonio Peak, from the Whitewater Canyon Preserve. Photo courtesy of Reginald Stanley. 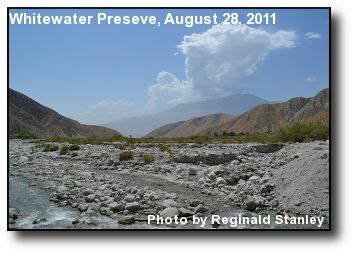 Whitewater Preserve: A view of a thunderhead above Mt. 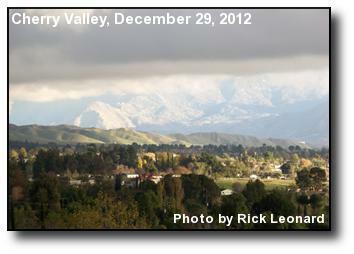 San Jacinto, from the Whitewater Canyon Preserve. Photo courtesy of Reginald Stanley. 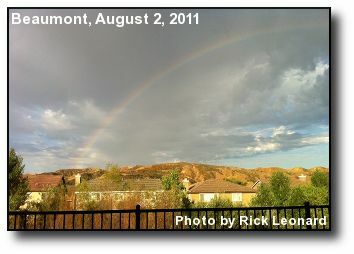 Summer Sprinkles: Sun and showers mix to form a rainbow. Photo courtesy of Rick Leonard. Mountain Thunderheads: Thunderheads billows above Mt. 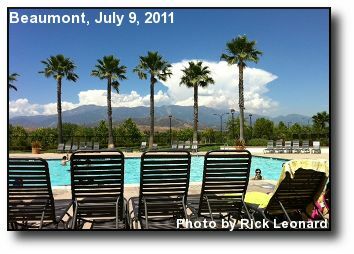 San Gorgonio in this view from a Beaumont pool. Photo courtesy of Rick Leonard. 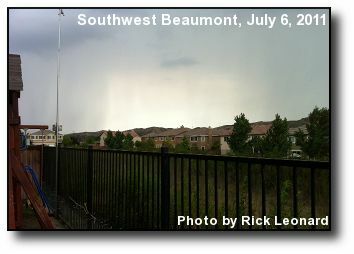 Stormy Weather: A thunderstorm clouds the skies around the Beaumont weather station. Photo courtesy of Rick Leonard. 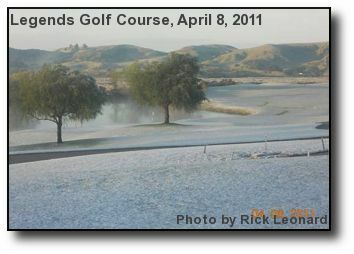 Snow Dusting: A rare April snowfall at the East Valley Golf Club in Beaumont. Photo courtesy of Rick Leonard. 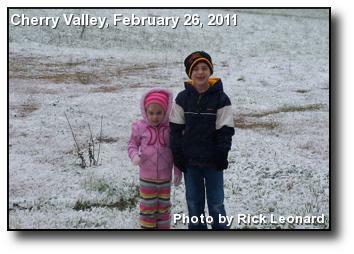 Light Snow: Kids enjoy a morning dusting of light snow in Cherry Valley. Photo courtesy of Rick Leonard. 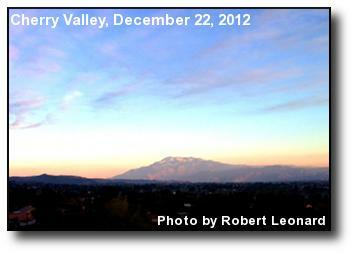 San Gorgonio: A view of white-capped Mt. 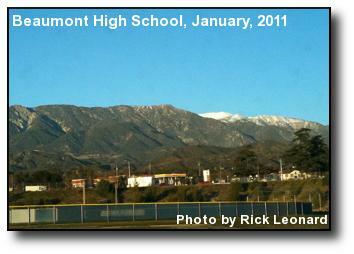 San Gorgonio, from the fields at Beaumont High School. Photo courtesy of Rick Leonard. 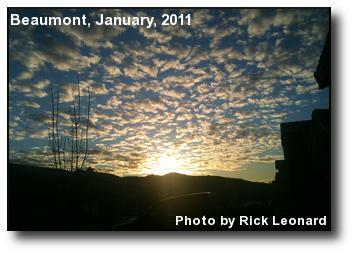 Cloud Array: Enlightened by sunlight, small clouds spread away from the horizon. Photo courtesy of Rick Leonard.